Reading to your child is more than just reading a book! Ideas from a reading teacher and mom of two children. Reading Oh! The Thinks you Can Think! The Day It Rained Hearts is written and illustrated by Felicia Bond. Felicia Bond is the illustrator for all of the If You Give A... series of books that are written by Laura Numeroff. This series started with If You Give a Mouse a Cookie. It is a good book to read on or before Valentine's Day. In the story, a little girl goes outside one day to find it is raining hearts. After collecting a number of different rain hearts, she goes inside. Thinking that it must be near Valentine's Day, she starts making valentines for all of her friends. Later in the story, we see her friends opening their valentines. In the end, it says that while it never rained hearts again, the girl found new ways to gather hearts for her valentines other years. It shows her outside with the trees covered with hearts. When I read this story to my four year old daughter, I asked her to think of other ways the little girl might have found hearts. She said that maybe there were heart shaped flowers. Ask your child how he or she thinks the hearts will come to the girl, and post a comment for your child's answers. I would love to hear the answers your children give. In my next posting, I will give a craft idea to go along with this book. I hope this book will you bring as much joy as it has brought myself and my kids! Can You See What I See? 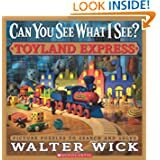 is a series of books by Walter Wick that are filled with elaborate, child-friendly pictures full of details, some of which the child is asked to find. What I love about these books is not only the great fun you can have finding the items with your child, but even more than that is the great language building opportunity the books lend parent-child reading time. Talk about the objects your child points to as he looks at each page and expand on them. For instance, if he points to a Christmas tree, say, "Yes that is a tall sparkly Christmas tree. What else do you see on the tree? What else on the page is sparkly like the tree?" The newest book in this series is Can You See What I See? Toyland Express. In it, the life cycle of a wooden train is followed from the building of it, display in the store, various stages of play, a yard sale, and back to being fixed up as good as new. It would make a special birthday gift for your child or to a special niece or nephew. Valentines Day is coming soon, and Counting Kisses by Karen Katz is a wonderful book to read to your baby or preschooler. It teaches counting backwards from 10 down to 1. On each page, kiss your child as the story indicates. It makes for a loving bonding between you and your child. For example, on the eight page the text reads, " eight squishy kisses on chubby, yummy knees ". I see one major disadvantage to this book. No capitalization is used on the cover title and author name. I always make a point to mention this to my children and show them how it should look. On each page, the number word AND the number are in large bold print. This helps draw the attention to the numbers. On repeated readings, have your child find the number or number word as you point out one. Above each number is a small line of hearts that match the number listed. Have your child count the hearts on each page. Lilly's Chocolate Heart by Kevin Henkes is a wonderful little book to read to your child this Valentine's Day. In the story, it is the end of Valentine's Day, and Lilly has one chocolate heart left. She wants to store it in a safe place. After thinking of all sorts of reasons why her hiding places aren't good ones, she decides her mouth is the best place for it! It is a smaller square board book, which is perfect for little ones. The story is sweet( no pun intended!) and humorous. It is a quick and easy read. Who doesn't like Lilly, a popular character in many Kevin Henkes books? The Dr. Seuss book titled The 500 Hats of Bartholemew Cubbins lends itself well to an art activity. I used to substitute teach, and kept this book in what I called my "Substitute's Bag of Tricks". When I needed a filler quick, this worked well. the king. Near the end of the story, as he nears the 500th hat, which turns out to be the last hat, the hats start changing and becoming more fancy with every new hat on his head. I stop at this part of the story, and have everyone design hats that show how they think the last hat will look. To make the activity the most fun, I like to have lots of hands on materials: buttons, beads, fake jewels, feathers, different colored paper and streamers, etc. In a pinch, though, it is still fun to have your child draw a picture of the last hat. Then, once everyone has made a hat, finish the story. Finally, after finishing and discussing the story, it is fun to talk with your child(ren) about how their hat was the same and different from the 500th hat. Dr. Seuss is such a popular author that Random House created a website just for his books. It is www.seussville.com. On the site, there are games, create your own Seuss stories, catalog of his products, and other surprises. Visit Seussville and comment on your favorite parts of the site. Dr. Seuss also has a national memorial in Springfield, MA. The website with information on the national memorial is www.catinthehat.org . If you are a teacher, or just want other ideas for using Dr. Seuss books with your child, check out http://atozteacherstuff.com/Themes/Dr_Seuss . A key point about Dr. Seuss' books is to HAVE FUN!!!!! Read his stories in a silly way. Experiment with using different voices for all of his zany characters! Dr. Seuss' Oh, the Thinks you Can Think! encourages children to use their imaginations. In my first read through with my kids, I focused on this aspect of the book. I read each page in the rhythmic, lively way it was meant to be read. We stopped to talk about the fanciful pictures. They spontaneously pointed out funny parts of the pictures. I did the same. Dr. Seuss makes up lots of words, and I pointed out that it can be fun to "think" up their own ideas and new words. After reading, talking about, or better yet, drawing their own picture of "thinks you can think" is lots of fun. If your child is drawing a picture, encourage the use of bright colored crayons to make the drawing more exciting. Today I plan on rereading the book. After the first couple of pages, I am going to point out the rhyming words. Then, as I read, I will pause at some of the words and allow my children to read the word. Even if your child is not yet reading, this is a good way to develop skills in figuring out words based on content, and in this case, rhyme. I will search out a few Dr. Seuss websites to check out in a future posting. Do any of you have a fun Dr. Seuss site to share with us? Please add a comment. Tags: context clues, Dr. Seuss, imagination, Oh, rhyming words, the Thinks you Can Think! Kohl's Cares for Kids is a great way to get hardcover children's books at the economical price of $5. The books can be purchased at Kohl's department stores. They also donate money from the sales to help children. I was pleased to find out that currently their selections are Dr.Seuss books. The following books are available: If I Ran the Circus, Oh the Thinks You Can Think!, The Lorax, and The Foot Book. Coordinating plush toys can also be purchased for $5 each as well. In future postings I will be talking about some of these books. The Everything Machine is a great book to get your child(ren) designing their own inventions. Even though this book is a picture book, I think even upper grade school kids would enjoy this book. Either before or after reading, help them build an "Everything" machine. With preschool or lower grade children, find materials from around the house, such as empty tissue boxes, paper towel tubes, popsicle sticks, paper, etc. They can use these materials to make their machine. Why is a paper towel tube used in your design? I like your color choices. Why did you choose the colors you did? What does this part (point at a part) do? If your child creates a machine, post a comment and tell us about it! Today I browsed through the New Book section of the library, and found a gem of a book titled, The Everything Machine, by Matt Novak. It was published in 2009. The story takes place on a planet called Quirk. The people on Quirk were given a machine that does everything for them, so they spend most of their days sleeping. One day, the machine breaks down and takes months to fix. The Quirkians slowly learn how to do things for themselves, and find they like to do things. So, the machine becomes a problem when it is fixed. But, the Quirkians come up with a clever solution in the end. 1. If you could have an everything machine, what would you want it to do for you? 2. What jobs do you want to do for yourself? Why or why not? Get the Subscribe XML Feed widget and many other great free widgets at Widgetbox!